Irish Trout and Salmon Flies, which appears here for the first time in paperback, needs no introduction, because it already is a classic. The first edition appeared in 1984, and it has been a very popular book ever since, being reprinted in 1993 by the Fly Fisher's Classic Library. The limted edition of the first was bound in an eye-smarting combination of blue and pale cream Moroccan goat skin, I kid you not (sorry, bad pun) and fetches quite stunning sums of money these days. Anyway, in my opinion this book is was and probably ever shall be the best source of definitive patterns for Irish flies, and this particular edition has the benefit of much sharper colour plates than its predecessors. The book isn't just a list of patterns, because Ted, who really can claim to being the top man on the subject, throws in a brief history of Irish flies and fly-makers, and expands on materials and dyes in an introduction which extends to nearly 80 pages. If you don't own a copy, you should definitely buy this edition, because it lists the dressing for just above every single traditional Irish pattern and then some. I use it all the time and actually wore out my first copy. 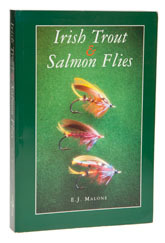 The companion volume to this book is Ted's wonderful Tying Flies in the Irish Style, which expands considerably on the introductory chapters in Irish Trout and Salmon Flies and should be on every serious fly tier's book shelf. Arguably, if you own these two books, you don't need any more on Irish fly tying, but I am sure that won't stop you.